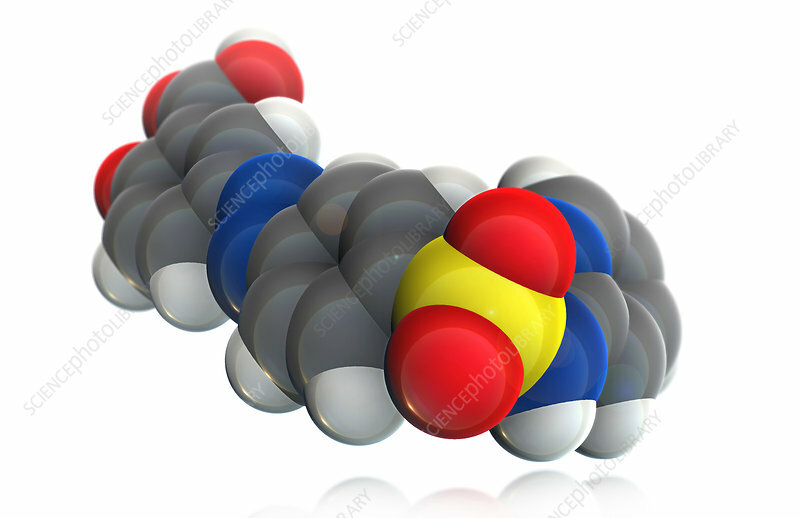 A molecular model of sulfasalazine, a disease-modifying antirheumatic drug used treat inflammatory bowel diseases such as ulcerative coilitis or Crohn's disease as well as rheumatoid arthritis. Sulfasalazine is believed to have anti-inflammatory properties that provide relief for patients suffering from Crohn's disease or ulcerative colitis, and helps to slow down or stop the progression of joint damage in arthritis. Atoms are coloured dark gray (carbon), light gray (hydrogen), red (oxygen), blue (nitrogen) and yellow (sulfer).